Scala is especially good for analyzing large sets of data as the scale of the task doesn't have any significant impact on performance. Scala's powerful functional libraries can interact with databases and build scalable frameworks ? resulting in the creation of robust data pipelines. The first module introduces you to Scala libraries to ingest, store, manipulate, process, and visualize data. Using real world examples, you will learn how to design scalable architecture to process and model data ? starting from simple concurrency constructs and progressing to actor systems and Apache Spark. After this, you will also learn how to build interactive visualizations with web frameworks. Once you have become familiar with all the tasks involved in data science, you will explore data analytics with Scala in the second module. You'll see how Scala can be used to make sense of data through easy to follow recipes. You will learn about Bokeh bindings for exploratory data analysis and quintessential machine learning with algorithms with Spark ML library. You'll get a sufficient understanding of Spark streaming, machine learning for streaming data, and Spark graphX. Armed with a firm understanding of data analysis, you will be ready to explore the most cutting-edge aspect of data science ? machine learning. The final module teaches you the A to Z of machine learning with Scala. 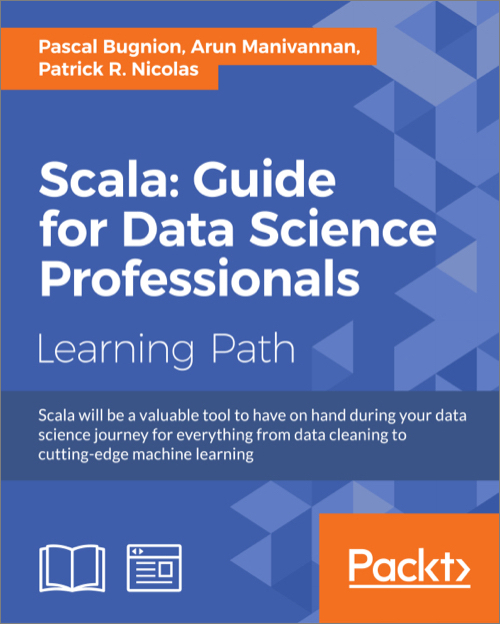 You'll explore Scala for dependency injections and implicits, which are used to write machine learning algorithms. You'll also explore machine learning topics such as clustering, dimentionality reduction, Naive Bayes, Regression models, SVMs, neural networks, and more.